Caboolture Markets is one of the South East’s longest established markets with 450 stalls selling everything from arts and crafts, homewares, plants and collectibles to trash and treasure. With 25 plus food vendors to choose from there is a breakfast or early lunch choice that suits almost everyone. The gates open at 5.30am (6am during winter) for the early birds so come on down, grab a paper and a bite to eat and have a browse through the stalls. At Caboolture Country Markets, we have just about anything you might ever need, every Sunday. With food, snacks, drinks from a variety of different cuisines and cultures. There is surely something to indulge or reward your tastebuds. Get a better deal than the supermarkets with an abundant selection of local fruit and vegetables, free range eggs, cheese even meat and seafood. Well known for having a plentiful supply of second hand goods and treasures. Art, spare parts, toys, books, jewellery, furniture and whatever else you can name are waiting to satisfy the hoarder within. Merry-go-rounds, jumping castles and many other activities to keep the young ones (and old ones) happy. Almost each week, various local events and competitions (such as cattle showing and equestrian) occur in the oval or arena. Being free to spectate, it’s great for you, family and friends to relax after shopping. Come and see and purchase the chickens, ducks, turkeys and other poultry at our animal nursery. You can also see and buy pets (such as goldfish and birds) from our stallholders. Various stalls also stock a wide range of accessories and food for pets and livestock (yes, we have hay and chaff available!). Farm Fantastic, Christmas and New Years day. Each week many casual stallholders join the markets ensuring there is always something new! View the growing list of regular stall holders here. Casual stall holder don’t need to book, just come along on any Sunday and enter via gate 3 on Beerburrum Road by 4.45am. Follow the signs and you will come to a lineup of cars. 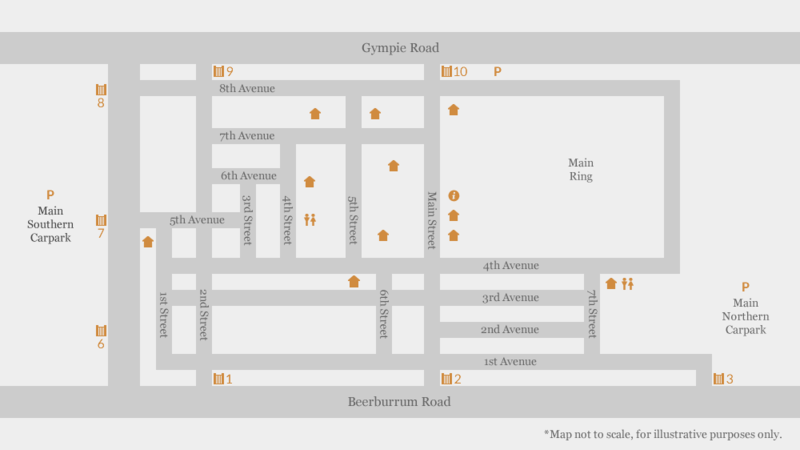 At approximately 5.00am you will be directed into the market area and to a site. (You cannot pick your own site). Sites are all 6 metres wide and the depth varies. Average depth is about 6 metres. Site cost is $25 plus $5 for power if you need it. You are required to provide your own tables, gazebos etc. Only one vehicle is permitted per site and must keep that vehicle within your site. Once on a site you cannot drive in the market area for any reason until the market is over and gates are opened. If there is an emergency, please call the market office on 5495 2030. You cannot sell food or drinks to be consumed at the markets. After you have attended 3 markets as a casual stall holder, you can visit the office and apply for a permanent site (waitlist). For more information, contact the market office on 5495 2030. Regular stall holders are required to complete an information form once every year. See office to collect your form. To receive a permanent site allocation or need more information, contact the Market Manager on 0402 991 396. Thinking about selling at the Caboolture Country Markets? Here is what you should know about before setting up. Selling your preloved furniture, appliances or tools? Just want to try out the markets and see how you go? No worries, you are not required to make a booking for a site in advance, just make sure you are in the queue (enter from gate 3 on Beerburrum Road) before 4:45am. At 5:00am you will then be allocated a site. If you need more than one site, make sure that you alert the market co-ordinator or assistant as you are coming in. Regular stallholders enjoy the benefit of being able to stay on the same site every Sunday and not having to queue. If you are planning on selling week in and week out, becoming a regular stallholder is the best way to go. You can apply once you have visited 3 times as a casual stallholder. The site fee is $25 per site for both casual and regular stallholders. If you require power, it will cost an additional $5 per 10 amp power socket used and $10 per 15 amp power socket used. From 7am, market volunteers will go around to collect the fees for the site and power (if used) and you will be given a receipt. What to and not to sell? You are welcome to sell anything as long as it is not illegal, dangerous or offensive. No food or drink intended for consumption on site may be sold without permission from management. We do not loan or hire equipment to use. Make sure you bring along everything you will need for the day. It is recommended to bring a marquee or umbrella for shade, and a table or ground sheet for your goods. You will need to visit the office at the Rhonda Bell Office on market days, or you can email sunmarket@cabooltureshow.com for more information. You can also call the office on 5495 2030 and following the prompts for the market office. If possible and convenient, place and display your goods on tables. Having a marquee or umbrella not only to shade yourself but visitors and they will be more likely to stop and look at your stall. Having great service and smile (especially as regular stallholder) helps improve the satisfaction of your customers and gaining regular customers. Also make sure that you have read and understood the market regulations and rules. A few things for stallholders to bear in mind when selling from a site at the Caboolture Country Markets. There is to be no sale or give away of alcohol on the grounds. Prohibited noxious and restricted plants are not to be brought to the grounds for sale or gift. Pocket knives need to be displayed in a locked cabinet. The sale of firearms or ammunition is not permitted. The movement of vehicles is not allowed during the public market operating hours of 5:15am – 12:00pm . This is for the safety of the public visitors. Vehicles can only be moved in extreme circumstances by prior knowledge, approval and under the direction of the market management. If you require electricity on your site, you will be charged at the rate of $5.00 for each 10 amp socket and $10.00 for each 15 amp socket used. All power leads and electrical appliances must be tagged to comply with Workplace Health and Safety regulations. Your stall must be setup within the allocated site area. Sites are not to be resold by the stallholders and the usage of the site is managed by the market management only. Food stalls and vans are to operate and sell from designated sites. Food stall and van owners are required to obtain a licence from the Moreton Bay Regional Council to be able to operate. Food stalls sites are limited to an agreed number which has been determined by the market management and current operators. New food stalls and vans will only be accepted once a site becomes vacant and gains approval from the market committee. Preparation and cooking must be done inside the registered food van. The Caboolture Market is operated by and for the Caboolture and District P.A. and I. Association Limited (Caboolture Show Society) Hereby referred to as CSS in this document. The Market Coordinator, in conjunction with the CSS Management committee is responsible for the day to day running of the market and the application of these rules. Any issues not covered here will be addressed by the Market Coordinator4 as they arise and all queries, complaints and suggestions should be addressed to the Market Coordinator in written form including email to sunmarket@cabooltureshow.com. It is a condition of entry to the Caboolture Markets that you follow and adhered to the policies and procedures listed here and comply with directives from Caboolture Market Officials and CSS Officials. Market Management reserves the right to enforce the policies and procedures as hereby stated. Caboolture Markets Webpage https://caboolturecountrymarkets.com.au/ you will see the information on the home page. Permanent stallholders must be in by 4.30am as gates will then close for casual stallholders’ entry. Gate 2 will close at 4.45am. 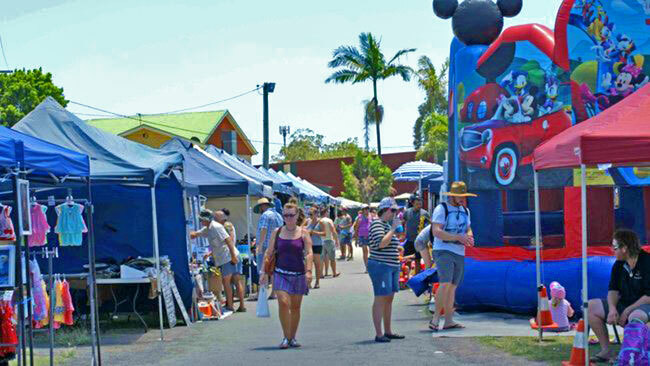 Permanent Stallholders Applicants must complete the online booking form located at https://caboolturecountrymarkets.com.au/ prior to entering the Caboolture Markets and having a site allocated for your use. Casual Stallholders must complete the online booking form located at https://caboolturecountrymarkets.com.au/ each market that you attend. This form must be submitted prior to attending the Caboolture Market. Food, drink must not be sold without the written permission from the Market Coordinator. Fruit and Vegetables must not be sold without the written permission from the Market Coordinator. The CSS, CSS staff, CSS Management, CSS Officials, Caboolture Markets Volunteers and Officials do not endorse any Political or Religious stall holder policies. You must remain within your site allocation area and should you been seen operating outside of this area you site will be cancelled, and you will be required to vacate the market. Customers and Visitors to the Caboolture Markets must be allowed to pass your site area without badgering and harassment from any stall holder. Sellers of seasonal goods may apply to the Market Coordinator for an absence of up to 6 months. A holding fee of $55.00 is applicable if absence is granted. Sites will be allocated on your return to the Caboolture Markets by the Market Coordinator. No previous sites will automatically be retained for seasonal growers. Sites generally have a six-metre frontage and the front corners are marked with white plastic disks. Site numbers are on coloured disks in the middle of the site frontage. They are stamped with a letter and a number (for example A53 or E21). Stallholders must set up wholly within their allocated site. Nothing may extend past the plastic markers or on to any roadway. This includes awnings, sandwich boards, signs and merchandise. Only one vehicle is allowed per site and must be parked wholly within the site. Stallholders must conduct their business from their allocated site only. No selling of raffle tickets other than approved Community Groups and Charities and must remain within their site allocation. Any selling of tickets outside of this area you will no longer be able to sell tickets. No Trucks allowed to be parked inside shed areas. The Market Coordinator makes the decisions about all site allocation. All Sites remain the property of the CSS and remain so. Market Stalls do not have any rights over the site they have been allocated. If you are selling your business, you can advertise this for sale but NOT the site your business in on. There is no guarantee that once your business is sold the site will be retained. You can NOT SUB LEASE meaning to allow someone to rent all or part of your stall to anyone else. This also includes alternate Sunday’s unless written approval is provided by the Market Coordinator. This will result in the loss of your permanent site allocation. Saturday – Between the hours of 2pm and 5pm – Subject to the grounds being available and not in use by another Event or Hirer on the Saturday. Notice will be in the Market News prior to the weekend in mention. The main oval gate will open between 4.30am and 5.00am Sunday morning. If your vehicle is found moving on the site prior to the official hours of vehicle clearance your vehicle will be stopped and you will need to wait with your vehicle until the correct traffic movement time. Casual stallholders wishing to stay overnight may enter via Gate 11 on Old Gympie Road, between 2.00pm and 4.00pm, please speak with the Market Coordinator prior to attending. The current fee is $25.00 per site. Leads plugged in overnight will pay $2.50 per 10/15 amp and $5.00 per 3 phase lead per night. Fees may increase with rises in costs including electricity rises. Should this occur you will be notified in writing one month prior to any change. Site fees will be collected by Market Officials and receipts will be given. If you are a permanent stallholder, you are permitted to have 2 consecutive markets away, 3 times in any 12-month period. If you have more than 2 weeks consecutive a fee of $5.00 per week will be charged to your site as a holding fee. The Holding Period is subject to approval by the Market Coordinator. All permeant stall holders are required to complete a New Site Booking Form each year prior to commencement of markets. All forms must be submitted no later than last Sunday Market in December to retain your current site. Caboolture Markets Cancellation Policy – Every effort will be made for the Markets to continue in the case of adverse weather. Once a Market has been cancelled there will be no reopening that day (No Exceptions). Our Team will make the decision as quickly as it can when advice is received, to ensure that no stallholder has already completed their set up and arrived at the markets. There will be no monetary or other renumeration provided by the Caboolture Markets or CSS if the markets are cancelled prior to the commencement of the Open to Public time. Should the markets be cancelled before the collection of fees then no fees will be collected on that day. Should fees already be collected and the markets have operated for 4 or more hours – no renumeration will be provided. All customers to the Caboolture Markets will be asked to leave the grounds as quickly as possibly safe and the grounds will be vacated, if conditions are safe to do so. Once the decision is made to cancel a market prior to the event all gates will be secured and any stall holders who may be already set up will be given 1 hour to pack and leave the showgrounds site, if conditions are safe to do so. If the decision is made during a market the Caboolture Market Coordinator and officials will notify you as stallholders, to as quickly as possible pack your items and vacate the site, if conditions are deemed safe to do so. If the market is closed due to a wind event that is happening then you are asked to ensure you have secured everything or take down your marquees, tents, umbrellas etc for safety of all attending the markets. The ability for our grounds to provide a safe underfoot and location for stallholders and customers as well. The Caboolture Markets Emergency Services Assistance policy is as follows. When a person is deemed to be in urgent need of emergency service assistance the person who is first on the scene must call 000. Informing CSS First Aid Officer on site of the incident. (The First Aid Officer has access to the onsite difibulator if this is required). CSS Officials that an ambulance is on the way to ensure gate entry with a clearway to the location of the person in need of emergency assistance location on the grounds. CSS WH&S Officer on duty to ensure that all paperwork required by law is completed and that there is no risk to other persons on the grounds. The person who is first on the scene is required to call 000 if access to fire equipment is not accessible. If required an ambulance should also be called. Informing CSS Officials that a Fire Truck is on the way to ensure gate entry and to provide a clearway to the location of the fire. WH&S Officer on Duty must complete all paperwork required by law and ensure there is no longer a risk to other persons on the grounds. The CSS Fire Warden will provide random checks of all Fire Exits and Fire Extinguishers throughout the Caboolture Markets grounds. Anyone who is obstructing these locations and facilities will be given a written warning and failure to comply will result in your site being removed from the Caboolture Markets. Power leads and electrical appliances used must be tested and tagged every 6 months and used in accordance with the Queensland Electrical Safety Act 2013 and/or Workplace Health and Safety regulations. Any leads/ appliances found without a current tag will be switched off and unplugged. The stallholders to have tagged prior to the next market for inspection. Please note: random inspections occur throughout the year with a representative of CSS WH&S Officers and a member of the CSS Electrical Contractor. Marquees, gazebos, tents, shade covers, umbrellas (any item that can become airborne and be a risk to those on the grounds) must always be securely anchored. Strong winds can spring up unexpectedly at any time. You are responsible for your own equipment should it damage other stallholder or showground property and all associated costs. Insurance Cover – Please note if you use the Caboolture Markets insurance cover this has an exclusion clause – UL14027 – Crowd projectiles exclusion. If you are a Stallholder (Permanent or Casual), you may be insured under the Caboolture Markets cover if you are within the following Acceptable Risks only. No cover will be provided to any stallholder who is within the Unacceptable Risk Category. Food and beverages (not food vans, not alcohol), Arts and Crafts, Novelties (e.g. glow sticks), Clothing and Accessories (i.e. sunglasses, jewellery etc), Temporary Tattoos (i.e. spray on), Books, Videos, DVDs, CDs, Souvenirs, Produce, exhibiting (marketing only not selling actual good s or services), Trash and treasure. Health/cosmetics;/ Medicines/ Potions/ Oils, Soaps, Alcohol, Amusements, Electrical Goods/Tools, Second hand Toys, Massage/ Therapy, Hazardous, Flammable or Dangerous Goods. Animals. All sites must be left clean and tidy. Unsold goods, cartons, rubbish etc must not be left onsite or anywhere on the grounds. Please take special care to remove all tent pegs and metal items which may create a hazard for ground maintenance workers. If you leave goods or rubbish behind you will be charged a cleaning fee or refused further entry as a stallholder. Food and drink must not be sold except with written permission from Market Coordinator. Bird stallholders must have the appropriate form required to have a stall at the Caboolture Markets. Plants – all plant stall holders must complete and provide a Certificate of Movement each Sunday. No Dogs allowed in the markets except certified: Guide Dogs, Hearing Dogs, Assistance Dogs. No alcohol is permitted in the markets. Not using amenities provided (urinating or other in public spaces) whilst a stallholder at the Caboolture Markets. A verbal warning from the Market Coordinator in person which will be recorded for you both to have a copy. You will also be notified of the recording and if you agree to continue – should you not agree to this then the Market Coordinator will proceed directly to the written letter and provided to you. Vehicles or Equipment of the above organisations have right of way and should your property impede these vehicles in any manner the Caboolture Markets or CSS will not be held liable for property damage through either replacement or financial means. Fresh fairy floss and snow cones for fetes, festivals and events. Jewellery – Fashion Accessories – Gifts – Fairy Garden Decor – I am always happy to create something special just for you. Avon – The company for women & a few good men. Want to be your own boss? CALL ME TO GET STARTED TODAY! It’s FREE! Receive FREE kit and ALL training is provided! Invite some magic into your garden. Create your own fairytale adventure with a miniature scene complete with furnishings and fairies. Exquisite handmade silver that is sure to inspire you! Bronte’s Gutter Guard has been established since 1996. It is a family owned and operated business where you not only deal with the supplier, but also the installer. Sandstone & Granite, Rock Walls, Excavation Demolition, Bobcat / Excavator Hire, Tipper Trucks & Tip Facilities. Solabrite Skylights can brighten up that dark area of your house or office, saving you time and money on that power bill. Hi Tech Mower Centre is your one stop shop for all your yard maintenance needs. Mowers, brushcutters, high pressure cleaners, generators, cordless garden tools and more. Discount fishing tackle supplies. Specialising in Sinkers, Jigheads, Downriggers and Deep Drop Weights plus a large range of top quality affordable tackle. The Caboolture Country Markets was founded in 1979 by Jack Lindsay and his wife, Jean along with a small band of volunteers. 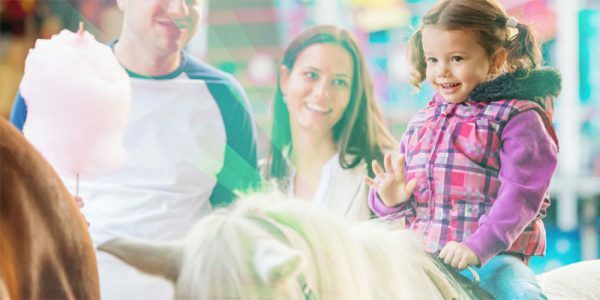 They envisioned to create a Sunday morning attraction in the area and the Caboolture Country Markets has since become one of the largest in South East Queensland if not Queensland. 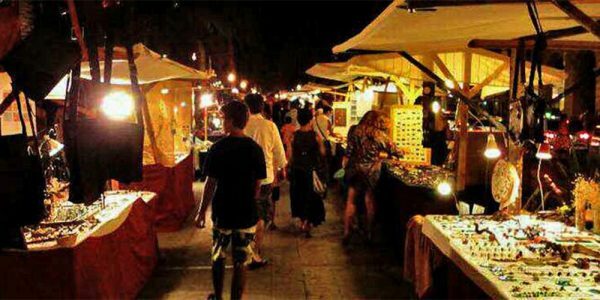 Attracting over 10,000 visitors through its gates and having 450 stalls setup on the average Sunday. 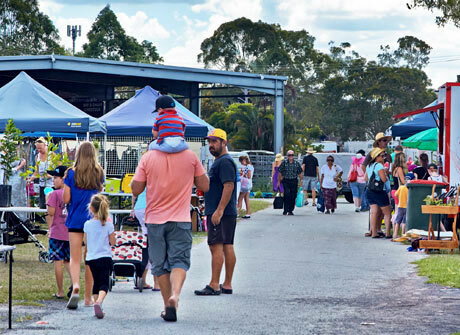 Situated approximately a hour’s drive north of Brisbane, the Caboolture Country Markets is very well known for its fresh, local produce, second hand goods, various plants and of course for it’s very strong community. Open every Sunday from 5.30am to 11.30am / 6am to 12midday during Winter (June 1st to August 31st). Driving is the most popular option with plenty of parking and multiple major roads leading to the markets via the D’Agilar Highway bypass. Parking is available through Gate A and 3 on Beerburrum Road and additional parking is through Gate 11 on Old Gympie Road. Be sure to hide any valuables, lock your doors, have your keys with you and turn off your headlights! Most importantly, do not leave animals or children locked in vehicles. The Caboolture Train and Bus Stations are located a short walk from the markets. Follow the pathways provided. Bringing a group to the Markets? Contact us on 07 5495 2030 and arrange access to our coach parking area right in the heart of the markets. Optionally, we can arrange morning tea and light refreshments with 7 days notice. Visitors to the Caboolture Country Markets, to make your visit and that of others an enjoyable experience please respect the following rules. Please obey the directions of market officials (who will be wearing a Show Society marked safety vest) at all times. Failure to comply may result in your removal from the grounds. With the exception of guide and other registered assistance dogs, no dogs are allowed in the market area. Please do not take shortcut through stalls, use the roads and walkways. This is for security reasons for the stallholders and yourself. Stallholders are not responsible or liable for any damage or injury to yourself or others caused by walking through stalls. This applies to both our visitors and stallholders. During trading hours there is no movement of vehicles within the grounds. Bicycles, skateboards and scooters need to be pushed not ridden in the grounds. The markets are an alcohol free zone, the sale and consumption are prohibited by law as the market area is a designated public place. The markets are smoke free with the exception of designated smoking areas. Phone: (07) 5495 2030 – Follow the prompts for the market office.